I told E about a Puerto Rican spot to try out, and she was all for it. Actually having some Puerto Rican heritage, she was totally in. 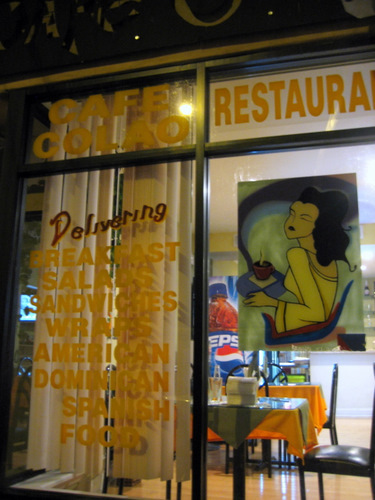 Cafe Colao is in a random location. It’s sort of in between fishtown and kensington, a little bit north of Girard on 5th street. There’s a mexican restaurant on the corner next to Cafe Colao, but there’s not much else there other than abandoned lots. When we got there, we were the only people eating. So yeah, it’s not on a particularly bustling thoroughfare. There’s a sign outside saying it’s under new management, and that it’s Dominican cuisine. 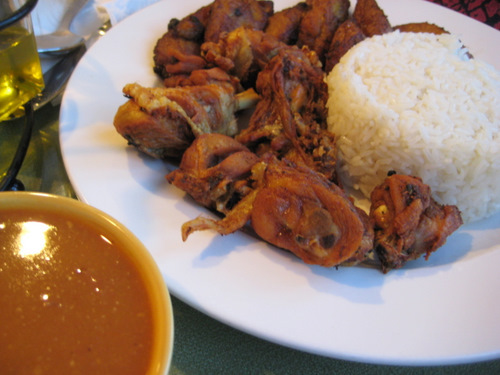 Well, we’re not sure whether it’s Dominican or Puerto Rican, but we were going for it anyway. The inside is bright and airy and cheery, but there’s no ambiance here at all. 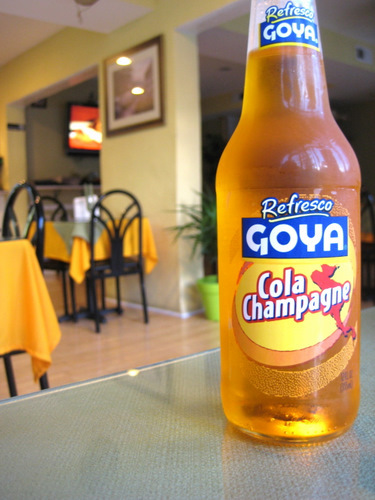 E ordered a Cola Champagne so that she could reminisce about the days of old. I’ve never had one of these before and it’s basically just fizzy sugar water, with a slightly odd flavor. And we both couldn’t quite put our fingers on what the exact flavor is. But to me, it tastes like a type of artificially flavored fruity candy. It does not taste like cola nor does it taste like champagne. It’s its own unique sweet flavor. We got an order of the fried chicken, which came with rice, fried sweet plantains, and beans. The chicken was crispy and not greasy, with no batter. This is good for me because I am one to actually remove batter. And it’s random pieces of chicken, so for those of you only interested in juicy white meat, move along! The plantains were awesome and so were the beans. The beans are soupy, but super tasty, with just the right spice. Here is what we really came for – the mofongo. This is the shrimp mofongo. What is mofongo? I had no idea what it was until I ate it. 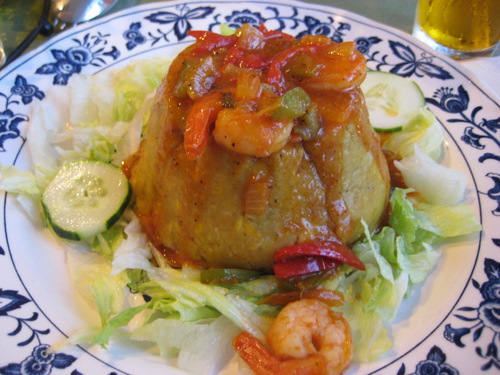 It is a dish made with mashed plantains (that’s the mofongo part), filled with shrimp and veggies and then topped with more shrimp and veggies. And it’s delicious! It’s like a little starchy dome made out of mashed plantains, and then the shove meats and veggies inside, and then top it with more of the meats and veggies. There’s all kinds of spices used to prepare the meat and I don’t know what they use, I just know it tastes good. It was truly unlike anything I’ve tasted before and I’m definitely going to try it again! One big piece of advice – be careful with reading and interpreting the menu. I thought that all of the menu items had the english name first with the spanish description below it. Oh hoow wrong I was! Actually, they have the spanish name of the dish first and then the english description below it. But, not all of them have an english description below it. And really, they probably don’t put english descriptions for the dishes they don’t want non-spanish speakers to try. Which is what totally happened to me here! I wanted the oxtail and I thought that “mondongo”, which was below that, was the spanish for oxtail. Oh no no no! 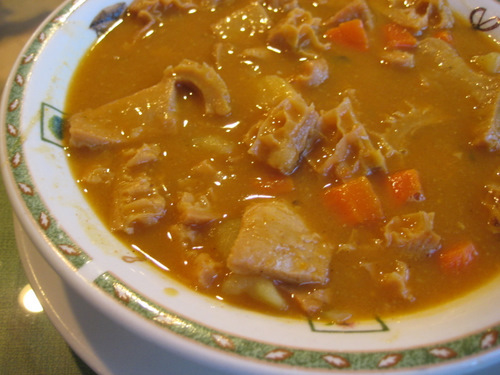 Mondongo, was just mondongo, and it wasn’t oxtail at all, but instead, it was a tripe soup. Ooh boy. I am not a tripe hater, and I can eat tripe in certain things, but a giant bowl of tripe just is not for me. The soup itself was fine, but the tripe had such a distinct innard smell that I could not get over. If it wasn’t for the smell, I would have been fine with it. The texture of tripe can offend some people but I don’t have a problem with it. What I had a problem with was the overwhelming smell of insides. When I ordered this mondongo, the server seemed a bit surprised. And I asked what it was and she said it was a soup. So I figured, oh, it’s an oxtail soup! Awesome! But no, it turned out to be soup full of tripe. You would think she would have mentioned the tripe to me, but oh she most certainly did not. So that was my lesson learned people! Be careful reading the menu! The service isn’t the best. Everyone was super nice, but they’re not particularly attentive, and we did not get our water refilled at all. There is a tiny bit of outdoor dining as well and it’s BYOB and cash only. Everything is quite affordable. If you’re willing to make the trek, go for a visit, but watch out for surprise tripe!